Rate Reviews "Overdue 60 Days"
Rate Reviews "Overdue 90 Days"
The Department of Human Services' (DHS) Community-Integrated Living Arrangement (CILA) Individualized Rate Determination Model has been used to determine personalized CILA rates since July 1, 1994. The CILA Rate Model has been in use for seven years and each time this "Introduction" section is updated it seems that we are reporting that some significant changes in the Model's rate setting methodology or Department procedures for rate setting and reviewing individual rates has occurred. Once again, we must report that very significant changes have taken place since the last update of this book. In October, 2000, a new Statewide Advisory Council on Developmental Disabilities was formed that includes representatives from all geographic areas of Illinois. The Advisory Council has formed a Finance Committee, among others, to address the issues contained in the Office of Developmental Disabilities' Strategic Plan. The Strategic Plan included several initiatives for the Finance Committee to address including, "Develop and implement consistent rate assumptions across all programs." A top priority of the Committee will be to develop and propose individualized day program rates for the various types of day services available. On November 1, 2000, the Department "unbundled" CILA services per a directive from the federal Centers for Medicare and Medicaid Services (CMS), formally known as the Health Care Financing Administration (HCFA). "Unbundling" CILA services meant that day program supports and individual therapies would no longer be a part of a person's residential CILA rate. These services were separated from the residential component and the community providers of the day and individual therapy services are now required to bill the Department for reimbursement. This change was mandated with the intention of increasing client choice, both in the type of services they receive and the providers from which they receive those services. This re-visitation of the CILA Individual Rate Determination Model updates the July, 1999 User Guide publication and incorporates the information distributed in various follow-up memoranda to the field. Policy and methodological changes, new or revised documentation requirements, and adjustments to the rate setting criteria used by Department staff in reviewing and running individual rates that have been adopted are included in this edition of the User Guide. The User Guide contains numerous tables that show the cost center-specific reimbursement rates used in the Model. Unless otherwise specified, these cost center reimbursement rate values are effective as of January 1, 2002. They incorporate all legislatively-appropriated cost-of-living-increases, special appropriations, and other allowance level adjustments made by the Department, including the $1.00 an hour Wage/Fringe Enhancement for Direct Service Persons, QMRPs, Supervisors, and "other, non-administrative support staff." Updated forms used by community agencies to submit original individual rate requests and during the rate review process are included in the addendums. Please begin using these revised forms immediately. Finally, there have been many successes and challenges associated with the day-to-day administration of the CILA Individualized Rate Model. The Model rate setting process that began in July, 1994, now has over 5,000 individual rates in the client data base and sets rates that total over $212 million in annual funding. CILA Rates Unit staff now mail out and make rate adjustments for over 400 scheduled Individual Rate Reviews each month. In addition, community agencies send in hundreds of unscheduled changes per month that adjust individual rates for things like client address changes, changes to individual nursing requirements, and new client income information. In the Department's opinion, the CILA rate setting process has vastly improved the method by which the State of Illinois reimburses community agencies for providing residential supports. Clearly, there are still many areas where the Department, community provider agencies, and Pre-Admission Screening (PAS) agencies can improve their performance within the administration of the rate setting process. Over the years, working together, we have made many improvements and we will continue to do so. This re-visitation of the CILA Individual Rate Determination Model User Guide represents another benchmark in timing for communicating our efforts along these lines. We remain committed to improving the Model's methodology and to making the administrative part of the rate setting and rate review processes as efficient and as routine as possible. Any questions on the content of this User Guide, or on the policies expressed within, should be directed to the CILA Rates Unit, Bureau of Community Reimbursement, 401 North Fourth Street, Springfield, Illinois 62702. Community-Integrated Living Arrangements (CILAs) provide flexible supports to persons with developmental disabilities in the person's own home or other community settings where eight or fewer individuals live together. CILA supports were first funded by the Department of Mental Health and Developmental Disabilities (DMHDD) in Fiscal Year 1989. At that time, rates were set at a "standard" level of $30,000 per person, per year, for individuals receiving 24-hour support and $16,400 for persons receiving Intermittent CILA support. In 1992, DMHDD first funded CILA supports for some individuals with developmental disabilities using a "Cost Over Standard" methodology. The Cost-Over-Standard methodology set rates that were generally higher than the standard $30,000 and $16,400 per year rate that were based on a specific provider's estimated costs, but used caps to apply limits on the upper levels of reimbursement that would be paid by the Department. "...an individualized rate and enrollment methodology for supporting the needs of people that is simple, cost effective, flexible, includes quality indicators, and allows for the personal choice of a provider, then apply it to all types of services across all agency programs." In 1993, work on a new rate-setting methodology began. Members from the Department's Advisory Council, with staff from DMHDD and the Department of Public Aid (DPA), convened to develop a methodology that would set rates based on a specific individual's needs and the conditions in which the CILA supports were being provided. In July, 1994, the CILA Individual Rate Model was implemented. Since that time, all rates for new CILA placements have been determined using the new rate-setting methodology. As of this writing, (January 2002) about 5,000 Model-determined individual rates have been approved with annualized total funding of nearly $212 million. On July 1, 1997, the Department of Mental Health and Developmental Disabilities was incorporated into the new Department of Human Services and the administration and oversight of the CILA Individual Rate Determination Model moved under the new Department. HCFA, now CMS, returned to Illinois to review the State's waiver programs in 1998 and placed several new requirements on the administration of the CILA program. Beginning in July, 1999, all adults in community residential settings, including CILA, were required to have a "Nursing Services Packet" (NSP) on file that documents, in detail, each individual's nursing needs. This information is now used to establish the reimbursement for all nursing services in the CILA rate for an individual. NSPs must be updated annually and the information must be corroborated by a Registered Nurse. Also in July, 1999, the Department's budget included a $1.00 an hour wage increase for the "Direct Service Person" component of the CILA individual rate. On November 1, 2000, as a result of a directive by HCFA, the Department "unbundled" the individual CILA rate so that the day services and individual therapy components of the rate were separated from the "residential" component. This change meant that the providers of these supports would now bill the Department for reimbursement after delivering the day or therapy services to the individual. Other, less significant methodological changes have been adopted and became effective in January, 2001. These changes were distributed to all provider agencies of CILA services and other interested parties in a February 2001 memorandum from Associate Director Melissa Wright. The changes explained in that memorandum are included within this User Guide. Most recently, Governor George Ryan and the Illinois General Assembly included in the Department's Fiscal Year 2001 and 2002 budgets the resources to provide another $1.00 an hour Wage/Fringe Benefit Enhancement. This time, however, the $1.00 an hour increase was targeted to all Direct Service Persons, other front-line staff, QMRPs, Supervisors, and "Other, Non-Administrative Support Staff" not only working in CILA homes, but in many other developmental disability programs. This Wage/Fringe Benefit Enhancement increased individual CILA rates by a Statewide average of 8.6 percent. The CILA Individual Rate Determination Model was first implemented in July 1994 as a way to fairly and equitably set reimbursement rates for agencies providing supports to adults in need of community-integrated residential services. The Model's evolution over the past seven years has been due, in part, to the federal government's involvement because of its commitment to assist the State in funding CILA services and, in part, as a result of the continued efforts of DHS staff, community agency providers, PAS agencies, and other interested parties. Undoubtedly, as has been proven over the years, more changes to the rate setting and administrative processes of the CILA services system and the CILA Individual Rate Model may be expected in the future. The Statewide Advisory Council on Developmental Disabilities, comprised of community agency representatives, family members, and consumers from each "network" area in the State have formed a Finance Committee and that committee is considering many issues related to rates and rate methodology. Treat all community provider agencies equally. Set rates based on the individual's need and the conditions of support. Express Department policy and the reality of fiscal constraint through incentive- and disincentive-based rate setting. The CILA Individual Rate Model sets rates based on the support need of the person to be served and the conditions under which the supports are to be provided. Reimbursement is founded on the principle of reasonable, predicted costs to support a person with developmental disabilities as determined by the Model, rather than the estimated costs that will be incurred as determined by a specific community agency or other entity. Using fixed cost center reimbursement rates based on system-wide provider cost report data where possible, and proxy values for expenses such as housing and transportation where necessary or appropriate, rates are produced for individuals that are the same across all providers given identical individual needs and conditions in which supports are provided. Effective November, 2000, Illinois "unbundled" the day program and individual therapy reimbursement from the CILA individual residential rate. "Unbundling" individual rates had a significant impact on the philosophy of the rate setting and service reimbursement process. Prior to this time, individual CILA rates included reimbursement for only one day program type, e.g., Developmental Training, Supported Employment. With "unbundling," individuals can be "authorized" for a variety of day program services and those services can be provided to the person by any eligible day program provider agency. This change increased the personal choice of day program activities in which CILA recipients could choose to participate and widen the number of community agencies from which services could be provided. "Unbundling" the individual therapies reimbursement also significantly changed the philosophy surrounding the delivery of these services. Prior to "unbundling," each individual had their therapies approved for a specific number of annual hours which were intended to be delivered. Since the reimbursement for these therapies was included in the total rate paid to the residential provider, it was often assumed that the residential provider agency would control which licensed therapist was going to provide the support. Now, each CILA recipient is authorized for a fixed number of hours of Behavior Intervention Services, Individual and/or Group Therapy, and Individual and/or Group Counseling. Physical Therapy, Occupational Therapy, and Speech Therapy services are authorized for a flat 52 hours per year, per person, once a prior approval request, including a denial from the State of Illinois' single Medicaid agency, the Department of Public Aid, is received. Medicaid-enrolled or DHS-approved licensed professionals who provide needed supports to CILA recipients now simply bill the Department directly for reimbursement. This change has also allowed increased consumer choice of individual therapy providers, as well as made it easier for residents, guardians, service coordinators, and residential providers to obtain needed therapies on short notice over an undetermined period of time. The CILA Rate Model continues to have built-in funding incentives and disincentives for different conditions of support. For example, the Model caps funding for expenses such as "Telephone" to be awarded to a maximum of six persons in a CILA home. For other cost centers such as "Maintenance and Housekeeping," reimbursement is capped to be spread across no fewer than four people. Likewise, reimbursement for expenses such as "Vehicle Payment" and "Vehicle Operation" have a "floor" and are spread across a minimum of four people. Staffing ratios too, have been set to provide a disincentive for very small or very large setting sizes. These Model incentives and disincentives are a way for the Department to encourage certain characteristics in the delivery of CILA supports and to acknowledge the financial reality within which the Department must exist. For some cost centers, the Department uses proxy values to set reimbursement rates. For example, individual rates include funding for housing and utilities. The "Housing/Utilities" reimbursement is set using data from the Department on Housing and Urban Development (HUD) "Fair Market Rent" (FMR) data series. Reimbursement equal to 120% of county-specific HUD FMR values are used as a proxy to reimburse community agencies for the cost of housing and utilities. It is the policy of the Department that its financial resources should be used primarily to purchase supports and services for the individual. The "Housing/Utilities" reimbursement is intended to assist in the purchase or rental of safe and decent housing. Community agencies are free to supplement the reimbursement received from DHS for housing or other proxy values as provided by the Model, but the additional expenses incurred in doing so are not reimbursed as a part of the individual CILA rate. The Department has followed a general policy that persons with predictable, stable, and noncontinuous medical needs are appropriate for CILA supports. Persons having continuous medical needs, or with medical conditions that require a nurse to be present as a preventative measure, require care in settings licensed to deliver nursing services and, therefore, may not be appropriate for CILA supports. In April, 1999, the Department added a "Base Nursing" reimbursement to the "Program" category of individual CILA rates equal to 12 hours of Licensed Practical Nurse (LPN) services and one hour of Registered Nurse (RN) service. "Base Nursing" is intended to pay for the health monitoring, assessment, and documentation of an individual's nursing needs. Effective July 1, 1999, the nursing services needs of all adults in community residential settings, and the corresponding reimbursement, is established using the information obtained from the "Nursing Services Packet" (NSP). Nursing "episodes" are determined and an annual number of nursing hours per individual are established. These hours are then reimbursed at a rate derived from the LPN and RN "staff-incurred" cost reported by community agencies on the Consolidated Financial Report (CFR), the Department's cost reporting mechanism. For persons with unpredictable and unstable behaviors, which, at times, may require one-to-one staffing, or one-to-one staffing for a determinable period of time, CILA may be an appropriate setting. However, as with continuous medical needs, for persons with extremely unstable behaviors which necessitate on-going one-to-one staffing for indeterminate periods of time, it is the Department's policy that settings other than CILA may provide a more appropriate environment at a more reasonable and economical cost. Since the July, 1999 edition of this User Guide, the Department has established a new rate setting methodology for Intermittent and "Family," or "At-Home" CILA settings. This new methodology allows the Department to reimburse community agencies for a variable number of staff hours that will be provided depending on the individual's need, rather than by modeling, or estimating the number of hours of staffing to be provided based on the person's ICAP score. The Department plans to examine its current practice of setting day program reimbursement rates with an eye toward establishing a rate methodology for each day program type. Such a methodology would consider the different cost components by day program service, e.g., staff-to-client ratios, capital, etc., and would be scaled based on individualized support need. This is expected to be a major activity of the Office of Developmental Disabilities' Statewide Advisory Council Finance Committee. By using a standard methodology to set individual CILA rates, the Department believes it has increased the degree of fairness and consistency across all community agencies who provide CILA supports. By using the funding incentives and disincentives that are built into the CILA Model, the Department tries to influence the character of CILA in the marketplace to be consistent with its policies and financial abilities. Promoting or discouraging certain conditions of support is the way the Department tries to balance individual choice and needs with Department policy and beliefs. This balancing function is a Department responsibility that is recognized and consciously considered when reimbursement rates are set, when changes to the Model's methodology are made, and when reimbursement policy is developed. For the purpose of explaining the CILA reimbursement methodology, after "unbundling," we will still consider an "Individualized CILA Rate" to be comprised of three major components: Base Support reimbursement, NonBase (Individual) Support reimbursement, and Day Program reimbursement. However, we need to clarify again that the Department has differing methods for reimbursing community agencies for these rate components. Individual Supports that are not included in the residential rate for which the providers of those services bill the Department directly for reimbursement, e.g., Behavior Services - Intervention Planning, Individual and Group Therapy, Individual and Group Counseling, Physical Therapy, Occupational Therapy, Speech Therapy, and Transitional Direct Service Person staffing. Day program services, while still an integral part of an individual CILA rate, are now billed to the Department separately by the provider of the service. Individual CILA recipients are now "authorized for billing" by day program type. This new aspect of "unbundled" day program service reimbursement is discussed in greater detail in the "Day Program" section of this User Guide. "Unbundling" did change the definition of the CILA "Topline Rate" used in previous editions of this User Guide. The "Topline Rate" is now equal to only the "Base Residential Support Reimbursement," plus any "NonBase Supports" that are included in the residential rate. From this Topline Rate, an "offset" is taken for a person's Third Party Payments, (i.e., earned income such as wages and unearned income such as Supplemental Security Income, Veteran's Awards, etc.). The result is called the "Bottomline Rate," or the rate paid by the Department to the community provider agency of the residential services. "Base Residential Supports" includes reimbursement for "Room and Board," "Program," "Transportation," and "Administration" and are paid in a "bundled" rate to the community provider agency of the residential services. "Base Residential Supports" are considered to be those costs that are incurred in the delivery of CILA supports to persons with developmental disabilities that are common to all CILA recipients with similar living arrangements, direct service staffing, and transportation needs. Base Residential Supports are not those services which are billed directly by the licensed professional, (e.g., physical therapy, occupational therapy, counseling, etc.). These services may be needed by one individual living in a CILA home but not another. Or, they may be needed more intensely by one individual versus another. These types of supports are considered "Individual" or "NonBase" Supports which are not included in the Base Residential Rate. These services are billed directly to the Department by the licensed or DHS-approved professional providing the service and the Department reimburses the provider after the services have been delivered. Certain NonBase Supports continue to be included in the Base Residential Rate paid to the community agency providing the residential services. These supports include all nursing reimbursement, dietician services, and additional staffing hours for special needs populations. These NonBase Supports are now paid directly to the licensed professional providing the services. These supports include Behavior Intervention Services, Individual and/or Group Therapy, Individual and/or Group Counseling, Physical Therapy, Occupational Therapy, Speech Therapy services, and Transitional DSP staffing. These services are "authorized for billing" for the individual by the Department. Reimbursement for "Day Program" cost was a major part of the "unbundling" of the individual CILA rate. Several day program options are available and are discussed further in the "Day Programs" section of this User Guide. This data is obtained from the DHS 403c, "Community Reimbursement Subsystem Financial Questionnaire" (See Addendum #6 ). Information on an individual's earned and unearned income is obtained and used to calculate the Third Party Payment. The Third Party Payment is subtracted from the Topline rate to produce the Bottomline rate, or the rate paid by the Department to the community provider agency of residential services. Is authorized in only the basic NonBase Supports Not Included in the Base Residential Rate, i.e., those supports which do not require a prior approval. The "Room and Board" major category reimburses community providers for those costs incurred in keeping a home in normal operation. The specific cost centers included under the Room and Board major allowance category are: 1) Housing/Utilities; 2) Telephone; 3) Building and Property Insurance; 4) Maintenance and Housekeeping; 5) Food Supplies; 6) Nonfood Supplies; and 7) Other, Not Elsewhere Classified. Housing/Utilities: A change was made effective July 1, 1999 in the method the Department uses to reimburse for "Housing" and "Utilities." These two formerly separate cost centers are now combined into one "Housing/Utilities" cost center. For 3- to 8-bed CILA homes, the FY2002 reimbursement rate paid for "Housing/Utilities" is equal to 120% of the Department of Housing and Urban Development (HUD) "Fair Market Rent" (FMR) data published in the October, 1998 Federal Register. HUD FMRs are available for homes up to four bedrooms in size. HUD advises users of the data to add 15% to the FMR values for each additional bedroom. The CILA Rate Model adds 15% each for homes of 5- and 6-beds, but caps the multiplier at the 6-bed level. For 1- and 2-bed CILA homes, the FY2002 reimbursement rate for "Housing/Utilities" is equal to the combined reimbursement levels for "Housing" and "Utilities" used in previous fiscal years, plus any legislatively-appropriated COLAs. As in the past, the reimbursement rates for 1- and 2-bed CILA homes are based on the principal and interest payment required for the median value of a home, by county, assuming an interest rate of eight percent and a loan term of 30 years. Mortgage Value Maximum - The "Mortgage Value Maximum" for 1- and 2-bed CILA homes is equal to the county-specific median value of houses from the 1990 Bureau of the Census, adjusted for inflation and/or legislatively-appropriated COLAs. The Model adjusts the Mortgage Value Maximum used in the housing reimbursement computation so that it is never less than 50 percent, or greater than 130 percent, of the Statewide median value. Data from the Year 2000 Census will be substituted for currently used home values when available. - The county-specific Mortgage Value Maximum derived from the 1990 Census and revised for COLAs is adjusted by the "Size of Home Adjuster" shown in the table to the right. The Size of Home Adjuster is now only used to adjust CILA homes with 1- and 2-beds. Accessibility and safety regulation compliance modifications to CILA homes are funded separately from the Housing/Utility allowance. For more information on the one-time reimbursement available for such expenses see Addendum #15, "CILA Start-Up Guidelines." A rate of $11.41 per person, per month, is paid to reimburse community agencies for the costs associated with all telephone and telephone-related expenses. "Life line" services, in the absence of other Direct Service Person staff, does not meet the definition of 24-hour supervision and the cost of the service is not reimbursed within this cost center. TDD equipment, although possibly covered by Medicaid, will be covered by "Start-Up Costs," if necessary and appropriate. The per person telephone reimbursement rate is applied to all CILAs sized 1- to 6-persons, but is capped at the 6-person level for CILAs of larger sizes. A rate of $741.83 per CILA site, per year, is included in the CILA Base Support of the individual rate to cover the costs associated with homeowner's or renter's property insurance. This allowance applies to property/building insurance for the residential setting only. Property/building insurance for administrative sites is considered to be included within the "Administration" cost center. The annual reimbursement is spread across the individual rates of all persons residing at the CILA home, but at a minimum, the allowance is spread across four persons. A rate of $57.06 per person, per month, is paid to reimburse CILA residential providers for the costs associated with maintenance and housekeeping, including, but not necessarily limited to, expenses associated with infrequent minor repairs, routine upkeep and service, and house cleaning services. The per person allowance for Maintenance and Housekeeping is applied to all CILA sizes 1- to 4-persons, but is capped at the 4-person level for CILAs of larger sizes. A rate of $2.28 per person, per meal, is paid to reimburse CILA residential providers for the costs associated with the normal expense for food items. The Model reimburses at the per meal rate for three meals daily and for 365 days per year. Special dietary needs that are physician-ordered and exceed the reimbursement allowance provided under the Food Supplies cost center are not included. Excess expenses, over and above the per person, per meal Food Supplies reimbursement for special dietary needs must be substantiated and approved as an Individual NonBase Support. A rate of $34.24 per person, per month, is paid to reimburse CILA residential providers for the expenses associated with NonFood Supplies. NonFood Supplies include, but are not necessarily limited to kitchen, housekeeping, and laundry supplies. Personal hygiene items are not included. The per person allowance for NonFood Supplies is applied to all CILA homes of 1- to 6-persons, but is capped at the 6-person level for CILAs of larger sizes. Other, Not Elsewhere Classified: This cost center is not currently in use. The "Program" allowance reimburses community agency providers for those costs incurred in providing habilitation services and supports, including training and other assistance, to persons with a developmental disability living in a CILA home. The cost centers included under the "Program" major category are: 1) Direct Service Persons; 2) Supervisor; 3) Qualified Mental Retardation Professional (QMRP); 4) Fringe Benefits; 5) Other Supplies; 6) Miscellaneous Consultant Services; and 7) Base Nursing. A "Staff Adjustment" table was put into place effective July 1, 1999. This adjustment table is applied to the Direct Service Persons hours (Prime, NonPrime, Night Shift, and Substitute Staff) only. Direct Service Persons: The costs of Direct Service Persons account for the largest share of the total individual CILA rate calculated by the Model. To understand the reimbursement computed for this cost center, one needs to understand the assumptions and internal calculations used in the methodology. The CILA Rate Model utilizes assumptions associated with "Time of Day / Day of Week," "Staff-to-Resident Ratio," "Client Support Need," "Type of Support," "Night Staff Sleep," "Substitute Staff Assumptions, and the new "Staff Adjustment" table to calculate the ultimate total reimbursement for the cost center Direct Service Persons. - The Rate Model assumes that the Direct Service Person needs of the individuals residing in CILAs vary depending on the time of the day and the day of the week. The table, "Time of Day / Day of Week" to the right shows the Model's assumptions concerning "Prime Time," "Non-Prime Time," "Night Shift," and "Day Program" hours used in selecting the appropriate staff-to-resident ratio. "Prime Time" - Those hours during weekdays when staff are needed most to assist the individuals living in the CILA home. Such hours may occur when staff are assisting residents with the activities associated with personal hygiene or evening meal preparation. Four hours per weekday and eight hours per weekend day are designated as "Prime Time." Prime Time on weekend days may include those hours when staff and residents engage in shopping, recreational activities, banking, etc., in addition to the Prime Time activities performed during weekdays. "NonPrime Time" - Those hours during the weekday when fewer Direct Service Persons are needed to train or assist the individuals living in the CILA home. NonPrime Time may include that time during the weekday when individuals are relaxing or are between major activities. Five hours each weekday and eight hours during each weekend day is designated as "NonPrime Time." "Night Shift" - Eight hours of each week and weekend day are designated as "Night Shift" hours. Staff-to-Resident Ratio Assumptions: The table below shows the CILA Rate Model Staff-to-Resident ratio assumptions. Notice that the ratios change depending on the time of day coverage required as discussed above in the section "Time of Day / Day of Week," as well as when the level of support need of the individual changes from "Low" to "Moderate" to "High." The number of hours of Direct Service Person hours computed per CILA home using the table above is then adjusted using the Staff Adjustment table. "Intermittent" Support Staff Coverage: A new Intermittent/Family Individual CILA Rate Model has been developed and put into use since the July 1999 edition of the User Guide was distributed. All new CILA placements into Intermittent or Family CILA settings have the reimbursement rate set using the new methodology. For those persons whose Intermittent or Family CILA rates were set prior to the development of the Intermittent/Family CILA Model, the original 24-Hour Shift Staff Rate Model adjusts the staff coverage for Direct Service Person to equal one-half the Prime Time hours used in a 24-Hour setting for persons of similar support need. Intermittent supports assume that no NonPrime Time or Night Shift coverage will occur. Staff Definitions: The hourly reimbursement for the Direct Service Persons and Supervision is broken down into the categories below. Fringe benefits are calculated separately and thus are not included in the hourly wage rates given for each position. Supervisor - That person who provides management oversight of the day-to-day operation of the CILA. The Model assumes that the supervisor-to-resident ratio is 1 to 16. An hourly wage rate of $12.41, not including fringe benefits, for the Supervisor position is reimbursed by the Model. The hourly rate reimbursement is assumed to represent the average wage rate paid to the Supervisor position, not the starting wage rate. Qualified Mental Rehabilitation Professional (QMRP) - That person who is qualified as a QMRP and provides programmatic oversight, service planning, and quality assurance activities. The Model assumes that the QMRP-to-client ratio is 1 to 16. An hourly wage rate of $14.00, not including fringe benefits, for the QMRP position is reimbursed by the Model. The hourly wage rate is assumed to be the average wage rate paid to the QMRP position, not the starting wage rate. Direct Service Person / Prime Time - The person(s) providing assistance to the individuals living in the CILA home during the most active part of the day consistent with the "Prime Time" hour definition described in the section, "Time of Day / Day of Week." The hourly reimbursement for the Direct Service Person / Prime Time is $9.92, not including fringe benefits. The hourly wage rate allowance is assumed to be the average wage rate paid to the Direct Service Person position(s), not the starting wage rate. Direct Service Person / NonPrime Time - The person(s) on duty during those hours of the day when less assistance is required by the individuals living in the CILA home consistent with the "NonPrime Time" definition described in the section, "Time of Day / Day of Week." The hourly allowance for the Direct Service Person / NonPrime Time is $9.92, not including fringe benefits. The hourly wage rate allowance is assumed to be the average wage rate paid to the Direct Service Person position(s), not the starting wage rate. Direct Service Person / Night Shift - The person(s) on duty and awake during the eight hour shift when residents are assumed to be sleeping. The "Direct Service Person / Night Shift" hourly wage is dependent upon whether the staff are allowed to sleep during their work hours per agreement with the CILA residential provider agency. Night Shift Awake Staff - The hourly allowance for the Direct Service Person / Night Shift declared "Awake Staff" is $9.92, not including fringe benefits. Night Shift Awake Staff do not sleep at any time during their working hours. Night Shift Awake Staff are expected to be awake and dressed during their entire shift at the CILA home. Night Shift Sleep Staff - The hourly allowance for the Direct Service Person / Night Shift declared "Sleep Staff" is $6.70, not including fringe benefits. Night Shift Sleep Staff are allowed to sleep during all or part of their working hours per agreement with the CILA residential provider agency. Substitute Staff - The person(s) who provide support services to CILA residents when regular staff are not present. Calculations are detailed below under the section "Substitute Staff Allowances." The hourly wage rate used for Substitute Staff is equal to the wage rate used for Direct Care Staff / Prime and NonPrime and is currently set at $9.92 per hour. This wage rate is assumed to represent the average wage paid to Substitute Staff. Unlike the reimbursement calculated for Direct Service Persons, fringe benefits are not added to the hourly rate paid for Substitute Staff. Substitute Staff Assumptions: The number of hours per week of "Substitute Staff" required is dependent on the amount of away-from-work training time that is assumed to occur by regular Direct Service Person staff, the number of time-off days allotted per Direct Service Person, and the number of days that the persons living in the CILA home are assumed to miss day programming either due to holidays, vacation, or illness thus requiring staff to be present in the CILA home. Substitutes/Staff Training Days- The Standards and Licensure Requirements for Community-Integrated Living Arrangements, (Rule 115) was revised in 1999. Section 320, part (d) of the revised CILA rule addresses the training requirements of Direct Service Persons. (See Addendum #18, "Standards and Licensure Requirements for Community-Integrated Living Arrangements." The CILA Model calculates the Substitute Staff needed for time away for training based on the Full-Time Equivalents (FTEs) calculated at each CILA home, multiplied by an assumed 50 percent turnover of the Direct Service Person staff each year, times eight hours for each of the three days of "off job site" training. This training is assumed to be for on-going, employee development activities as outlined in each agency's "employee development plan" and is does not refer to the 40 hours of class room and 80 hours of on-the-job training required for all Direct Service Persons working in the CILA program that is reimbursed separately from the individual CILA rate. - The CILA Model has built in a total of 31 days for Direct Service Persons to be on paid days off. The table to the right shows how those days are defined. To provide CILA Direct Service Person coverage on days when staff are absent, the Model multiplies the total number of days allowed by the number of FTEs calculated for the CILA home by eight hours per day to compute the "Substitutes/Staff Time-Off" assumption. Using this formula, the Model assumes that all Direct Service Persons will use all their available time-off days during the year and will receive three days of additional training every year. Substitutes/Residents No Day Program - Under the 31"Time of Day / Day of Week" assumptions, the CILA Model subtracts seven hours per week day for that time when persons living at the CILA home are assumed to be attending day programs. The Model builds back in to the staff requirement an assumption of the number of hours for Substitute Staff required to be present when residents are not at their day program. Substitute Staff for Holidays - The Model assumes that day or vocational programs will be closed eleven days per year for holiday time and that all the residents of the CILA will be home on the same eleven days per year. This assumption is accounted for in the "Resident Factor" figure shown in the "Substitute Staff Assumptions" table. (See "Resident Factor" equal to "1." Note: Had the assumption been that persons may be absent on different holidays, the Resident Factor would have been equal to "4" in our example, as is the case in "Substitute Staff for Resident Sick Time.") The staff-to-client ratio for the seven hours per holiday time built back into the allowance is equal to 3.5 hours of Prime Time coverage plus 3.5 hours of NonPrime Time coverage. Substitute Staff for Vacation Days - The Model assumes that the day or vocational program closes for two work weeks per year (ten weekdays) for vacation time. The Model assumes that all the residents of the CILA will be home on the same ten weekdays per year. This assumption is accounted for in the "Resident Factor" figure shown in the "Substitute Staff Assumptions" table. The staff-to-client ratio for the seven hours per vacation day built back into the allowance is equal to 3.5 hours of Prime Time coverage plus 3.5 hours of NonPrime Time coverage. Substitute Staff for Resident Sick Time - The Model assumes that each resident will miss five days per year due to illness. One Direct Service Person position is allocated for the seven hours an individual is home from his/her day or vocational program due to illness. The Model liberally assumes that no two CILA residents will be sick on the same day and, therefore, the "Resident Factor" in the Substitute Staff for Resident Sick Time is equal to the number of total persons residing at the home. The staff-to-client ratio for the seven hours per sick day built back into the allowance is equal to the NonPrime Time coverage rate. Staff Adjustment Table: "Smoothing" the Effect of the ICAP on Rates: This was a significant change in the way the CILA Rate Model calculates reimbursement rates. All of the calculations described above continue to be done and are consistent with the methodology used to calculate Direct Service Person reimbursement since July 1, 1994, when the Rate Model was first implemented. However, beginning on July 1, 1999, the values calculated through the steps described above are adjusted by the "Staff Adjustment" tables intended to "smooth" the effects of the individual's two-digit ICAP score on the reimbursement rate. NOTE: Only the number of hours of "Direct Service Person" is affected by this adjustment. Reimbursement for "Supervisor" and "QMRP" hours remain constant at a 1 to 16 ratio for all rates. Historical Method of Calculating Direct Service Person Reimbursement: In the past, persons with ICAP scores ranging from 1 to 39 were deemed to be of "High" support need. Persons with ICAP scores ranging from 40 to 69 were of "Moderate" need, and persons with scores 70 and above were considered to be of "Low" need. Using this three-tiered method to determine support need resulted in large individual rate changes as persons living in CILAs underwent small increases or decreases in their ICAP scores. An ICAP score change from 39 to 40 caused a person to be reclassified from "High" need to "Moderate" need. This one digit change resulted in a significant rate decrease even though the needs of the individual changed only marginally as measured by the two-digit score. 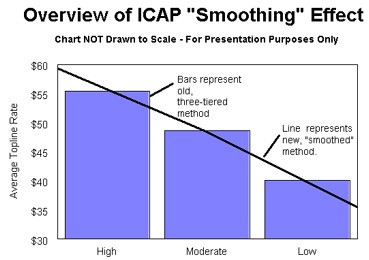 The "Smoothing" Adjustment: To correct this three-tier method and the wide swings in individual rates it produced, the Department implemented an adjustment factor to "smooth" the effect of the ICAP on individual rates. The only cost center in the Model, besides the "Miscellaneous Consultant" cost center, that is affected by the ICAP level is "Direct Service Person" reimbursement. The adjustment factor multiplies the number of Direct Service Person hours computed by the Model based on the old, three-tiered ICAP method and the staff-to-client ratios used by the adjustment factors for each of the Direct Service Person categories. Establishing the "Smoothing" Multipliers: To establish the "smoothing," or adjustment multipliers, the CILA Model client database was sorted by ICAP score from lowest to highest and then broken down into the three former support need categories, i.e., 1 to 39, 40 to 69, and 70+. Then, the median value of each range was identified. The median values for each range were determined to be 29, 57, and 77 based on the data available from "approved/placed" individual CILA rates, October, 1998. These median values were reviewed in May, 2001 and had changed to 28, 56, and 76. It was determined that the difference in the median values was not enough to justify a revision in the Staff Adjustment Table. The CILA Rate Model continues to use the values of 29, 57, and 77 as the basis for the staff adjustment. These three median ICAP scores were then established as the "100%" level in the adjustment multiplier table used to "smooth" the ICAP score effect on reimbursement. An ICAP score of 29 is now equal to 100% of the old "High" need number of Direct Service Person hours for each staffing type. Likewise, under the new system, ICAP scores equal to 57 and 77 are equal to 100% of the old "Moderate" and "Low" need number of Direct Service Person hours, respectively. Addendum #21, "Calculating a Draft CILA Rate," shows the adjustments multipliers for each ICAP level and CILA home size. Essentially, the multipliers involve a straight line adjustment as ICAP scores move up and down the scale between established median values, e.g., in the example used throughout this edition of the User Guide, a rate for a person in a 4-bed CILA home with an ICAP score of 50 receives 100.0% of the "High" need Direct Service Person "Prime Time" hours, 62.5% of the "High" need NonPrime Time hours, 100.0% of the "High" need "Night Shift" hours, and 86.8% of the "High" need "Substitute" staff hours. In sum, the CILA Rate Model now calculates the number of Direct Service Person hours that will be included in an individual rate as it has in the past, except now those hours are adjusted by a staff type-specific multiplier, i.e., (Prime, NonPrime, Night, and Substitute staff). The final result is the number of hours of staffing that is shown on the individual Rate Sheet and in the table below. Fringe Benefits: The CILA Rate Model calculates the total dollar allowance for Direct Service Persons, the Supervisor, and the QMRP and multiplies it by 20 percent to calculate the "Fringe Benefit" allowance. Substitute staff, who in practice may be part-time staff not receiving the same wage or benefit package as regular full-time Direct Service Persons, are not included in the fringe benefit calculation, but are paid by the Model at the regular Direct Service Person hourly wage rate. The cost center, "Other Supplies" refers to costs incurred in the provision of habilitation and training services associated with the activities of daily living. The Model allocates an allowance of $273.91 per person, per year to cover the cost of "Other Supplies." The reimbursement is provided to all persons living in the CILA home. Miscellaneous Consultant Service: An allowance of $342.38 per year for persons with "Intermittent" or "Low" support need (ICAP over 70), $452.50 per year for persons with "Moderate" need (ICAP between 40 and 69), and $565.63 per year for persons with "High" need (ICAP between 1 and 39) is built into the individual rate to provide reimbursement for consultant services that may be necessary to provide assessments and develop various therapy plans. Department staff reviewing individual NonBase Support funding requests will consider whether the community agency has fully used this reimbursement prior to applying for NonBase Supports. Base Nursing: Effective April 1, 1999, reimbursement for 12 hours of Licensed Practical Nursing and one hour of Registered Professional Nursing was added to the Base Support reimbursement of all adults receiving community residential supports, including Model CILA reimbursement. The addition of "Base Nursing" to all individual CILA rates recognizes the need for persons with developmental disabilities to have regular health care supports and monitoring. "Base Nursing" is intended to reimburse community agencies for the cost associated with the completion of nursing assessments, health risk identification and planning, health supports coordination and implementation, health monitoring, and to develop updates to the nursing care plan. Transportation cost is incurred while providers assist and/or train the persons living in the CILA home in the activities of daily living. The transportation cost reimbursed in the residential CILA rate is not intended to include the costs associated with travel to-and-from an individual's day program. Rather, the transportation reimbursement included in the residential rate is intended to pay for expenses incurred in providing general transportation to-and-from places not covered by the Department of Public Aid's (DPA) Medicaid State Plan. This DPA service will pay for transportation for eligible individuals to go to-and-from physician and therapy appointments, or any other State Plan service. The CILA Model uses the assumptions associated with the purchase of a vehicle and its operating costs to compute the "Transportation" cost center reimbursement. In practice, providers may be using local public transportation, may lease vehicles, or may purchase larger and more expensive vehicles to provide transportation to more than one CILA home. These costs are assumed to be covered, in the aggregate, by the "Vehicle Purchase" and "Vehicle Operation" allowances of the "Transportation" major allowance category. Vehicle Purchase: The CILA Model assumes that the purchase price of a vehicle will be $18,260 for ambulatory residents and $28,260 for nonambulatory residents and that the vehicle will be financed over five years at an interest rate of eight percent. The "Vehicle Payment" costs are spread across each of the persons living in the CILA home, but are capped to be spread across a minimum of four persons. Vehicle Operation: The "Vehicle Operation" reimbursement is intended to cover expenditures for fuel, oil, maintenance, comprehensive insurance, licenses, and repairs that would normally occur on the vehicle described above. An allowance of 32.5 cents per mile and 10,000 miles per year are assumed in the model. "Vehicle Operation" costs are spread across each of the residents in a CILA, but are capped to be spread across a minimum of four persons. All administrative costs associated with community agency overhead expenses as they relate to the delivery of CILA supports are included within the "Administration" cost center reimbursement. Community agency overhead is assumed to include all the costs associated with administrative staff, administrative clerical staff, office space costs, office operating expenses, insurance, management consultants, accounting, the cost of hiring staff, staff physical examinations, staff travel and training, conferences, conventions, association fees, and all other costs incurred in the overhead associated with the delivery of CILA supports. The calculation of the "Administration" reimbursement was changed effective July 1, 1999. The Administration reimbursement was converted from a percentage of the CILA Base Residential rate to a annual fixed amount. The current reimbursement for Administration in the Model is equal to $3,124 per client for all "24-Hour Shift Staff" and "Foster Care" setting types and is equal to $1,562 for all "Intermittent" and "Family CILA" support types. Effective November 1, 2000, the reimbursement for day program expenses is no longer included in the CILA residential rate. At this time, reimbursement rates for day programs are set at fixed levels. It is the intention of the Department of Human Services to develop and implement day program rate methodologies that produce reimbursement levels that are specific to the type of day program being attended and the support needs of the individual. All costs associated with the delivery of day program services are considered to be reimbursed by the rates funded by the Department. This includes all capital, staffing, and the transportation costs inherent in getting persons to-and-from day program sites. Individuals with developmental disabilities who are of working age (18-60) are expected to participate in productive activities and earn money and/or participate in school or other adult learning activities. Therefore, participation in accredited Supported Employment, certified Developmental Training, and/or accredited Regular Work/Sheltered Employment is preferred for this age group. All providers of day program services must have a current contract with the DHS Office of Developmental Disabilities. Providers of specific services must also meet the following minimum qualifications. Individuals must be authorized for the services prior to billing. Programs must be certified by the DHS Bureau of Accreditation, Licensure and Certification according to the requirements of Rule 119 (DT). Developmental Training programs must also be in compliance with the Department's requirements for national accreditation. Developmental Training services prepare adults 18 years of age and older to live and function in an integrated social setting. The reimbursement for all persons receiving standard Developmental Training services is currently equal to $9.46 per hour for a maximum of 1,100 hours, or $10,403 per year. Regular Work/Sheltered Employment: A long term employment program carried out in a sheltered work environment. Regular Work programs must be in compliance with the Department's requirements for national accreditation. The reimbursement for all persons receiving standard Regular Work services is currently equal to $9.46 per hour for a maximum of 1,100 hours, or $10,403 per year. Supported Employment: Supported Employment is provided and billed in four different varieties. Community agency providers of Supported Employment must bill the Department in one of these categories to receive reimbursement. Providers of Supported Employment must be in compliance with the Department's requirements for national accreditation. Supported Employment staff provide, advocacy, on-going assessment, training, counseling, coaching, and follow-up services to maintain individuals in competitive jobs at integrated work sites. To receive Supported Employment reimbursement, community agencies must first forward to the Department a confirmation from their local Office of Rehabilitation Services (ORS) that ORS Supported Employment funding is not available. SEP/Individual, Job Coach Present - An SEP Job Coach is present and providing one-to-one supports for the entire time that the community agency is billing the Department. The reimbursement for all persons receiving standard SEP/Individual services is currently equal to $11.87 per hour for a maximum of 1,100 hours, or $13,058 per year. SEP/Individual, No Job Coach Present - Same as SEP/Individual, but no job coach is present during the on-the-job hours the individual is working. The reimbursement for all persons receiving standard SEP/Individual, No Job Coach Present services is currently equal to $11.87 per hour for a maximum of 1,100 hours, or $13,058 per year. SEP/Group, Job Coach Present - The same as Supported Employment/Individual above, however; staffing is not one-to-one but is instead provided in a group arrangement. The reimbursement for all persons receiving standard Supported Employment/Group, Job Coach Present services is currently equal to $10.59 per hour for a maximum of 1,100 hours, or $11,644 per year. SEP/Group, No Job Coach Present - Same as SEP/Group above, but no job coach is present during the on-the-job hours the individual is working. The reimbursement for all persons receiving standard Supported Employment/Group, Job Coach Present services is currently equal to $10.59 per hour for a maximum of 1,100 hours, or $11,644 per year. Department on Aging Adult Day Care: Persons receiving Department on Aging Adult Day Care services do not attend a traditional Day Program, but rather will attend a program designed for people over working age. Providers must have a current contract with the Department on Aging to be authorized to bill for this day program type. Individuals being served in this day program must be age 60 or older. The reimbursement for all persons receiving standard Department on Aging Senior Day Program services is currently equal to $7.34 per hour for a maximum of 1,100 hours, or $8,074 per year. At-Home Day Program: "At Home" day program is a category that is used to specify billings for those clients who do not attend a traditional day program and have their day program hours of service delivered by the residential community agency provider. At Home day programs must provide a structured daily program of goal-oriented activities, consistent with the Individual Service Plan (ISP). Television watching and other leisure activities do not constitute a day program, except when the ISP documents that advanced age (75+ years) precludes goal-oriented activities, then leisure activities may be the focus of the day program and individuals may choose to participate in At Home day programs. Providers of At Home day programs must be licensed by the DHS Bureau of Accreditation, Licensure and Certification according to the requirements of Rule 115 (CILA). Providers must also be in compliance with the Department's requirements for national accreditation. Other Day Program: "Other" day program is a category that is used to specify billings for those clients who do not attend a traditional day program and have their day program hours of service that are not delivered by the residential community agency provider. Other day programs must be approved, in writing, by the Associate Director of the Office of Developmental Disabilities. Approval is based on national accreditation status or submission of a satisfactory program description and plan for the individuals served and credentials showing involvement of a QMRP in the implementation of the program. Once approved, providers must have a contract with the Department. Other day programs provide a structured daily program of goal-oriented activities, consistent with the Individual Service Plan (ISP). Television watching and other leisure activities do not constitute a day program, except when the ISP documents that advanced age (75+ years) precludes goal-oriented activities, then leisure activities may be the focus of the day program and individuals may choose to participate in Other day programs. NonBase Supports Not Included in the Residential Rate. The CILA Rate Model allows NonBase Support reimbursement for expenses incurred in the delivery of services that are specific to an individual's needs. "NonBase Supports Included in the Individual Rate" are those services which are incurred by community agencies due to special, added supports required by a specific individual residing in a CILA home that is not covered by the increased Direct Service Person staff-to-client ratios built into the Model's Base Cost as support needs increase from "Low," to "Moderate," to "High" and are in excess of the reimbursement provided under the cost center of "Miscellaneous Consultant Services." NonBase Supports are not common to all residents, they may only be required temporarily, and they must be substantiated by the assessments or evaluations of a qualified assessor, and be supported through the Goals and Objectives in a person's Individual Service Plan (ISP) as determined by the Community Support Team. Department staff review and approve all initial requests for NonBase Supports to be included in the residential rate and requests for continued or increased NonBase Support funding via the Individual Rate Review process. Nursing Reimbursement: All nursing reimbursement is categorized into two classifications: "Medication Administration" and "Nursing Treatments." The Nursing Services Packet (NSP) is used to determine the number of "Medication Administration" and "Nursing Treatment" hours per year that an individual requires. Medication Administration: Effective July 1, 1999, Public Act 91-630 allows trained and authorized Direct Service Persons to administer oral or topical medications, or other means of medication administration as deemed appropriate, under the direction and monitoring of a Registered Nurse. The Department reviews the information provided in the individual NSP and determines the annual number of hours required to administer medications using standard, pre-determined criteria. Medication Administration / NonNurse Staff - The number of annual hours calculated for trained Direct Service Persons to do simple administration of noninvasive medication, e.g., taking a tablet, application of medical cream, etc. Based on the information contained in the individual's Medication Administration Review (MAR), medication administration "episodes" are determined to be either five, ten, or 15 minutes in duration, depending on the duties to be performed. No reimbursement add-on is provided for Direct Service Persons staff to do allowable "medication administration." Medication Administration / RN Monitoring - RN Monitoring hours are calculated at a 1:12 ratio to "Medication Administration / NonNurse Staff." RN Monitoring hours are an automatically derived value based on the number of hours of Medication Administration / NonNurse Staff calculated. An hourly rate of $19.93 is used to reimburse community agencies for the costs associated with providing RN Monitoring of trained Direct Service Persons to do allowable "Medication Administration." Nursing Treatments: The number of annual hours of "Nursing Treatments" is determined by reviewing the information in the individual NSP. Nursing Treatments / LPN - The number of annual hours calculated for an Licensed Practical Nurse (LPN) to administer Nursing Treatments, e.g., insulin injections or other "invasive" medications or treatments. Based on the information contained in the individual's Treatment Administration Review (TAR), Nursing Treatment "episodes" are determined to be either five, ten, or 15 minutes in duration, depending on the duties to be performed. An hourly rate of $16.03 is used to reimburse community agencies for the costs associated with providing approved LPN nursing treatment supports. Nursing Treatments / RN Monitoring - RN Monitoring hours are calculated at a 1:12 ratio to "Nursing Treatments / LPN." Like the RN hours described above, the RN Monitoring for nursing treatments is automatically derived based on the number of hours of Nursing Treatments / LPN hours calculated. An hourly rate of $19.93 is used to reimburse community agencies for the costs associated with providing RN Monitoring of LPNs to do "Nursing Treatments." Dietician: An hourly rate of $28.54 is used to reimburse community agencies for the costs associated with providing approved dietician supports. Dietician requirements must be substantiated by a physician-prescribed special needs diet and be included as a recommendation on the individual's ISP. Other NonBase Supports Included in the Residential Rate: Any other supports included in the residential rates are reviewed by Department staff on a person-by-person basis. Each NonBase Support listed below has a set, Statewide hourly reimbursement rate. The hourly reimbursement rates shown are either based on the Statewide Medicaid reimbursement rate for the service, or were based on information contained in the Comprehensive Financial Report (CFR). For all of the services listed below, the licensed or DHS-approved professional providing the support, or a community provider acting as the payee, bills the Department directly for reimbursement for services rendered. Supports Requiring Medicaid Denial - Individuals receiving CILA services will be "authorized" for the NonBase (Individual) Supports below upon receipt of a denial for reimbursement by the Illinois Department of Public Aid, the State's Medicaid agency. Community agencies should obtain a denial from the Department of Public Aid for the desired therapy and include it in the Individual CILA Rate Packet or forward it to their Network Facilitator when the services are required. Community agencies should note that retroactive authorization will not be made beyond the date of the Department of Public Aid denial. Physical Therapy (Program Code 52P): An hourly rate of $39.16 is reimbursed to therapists or their payees for the costs associated with providing authorized Physical Therapy supports. Physical Therapy requirements must be substantiated by an assessment or evaluation and be included as a recommendation on the individual's ISP. Occupational Therapy (Program Code 52O): An hourly rate of $39.16 is reimbursed to therapists or their payees for the costs associated with providing authorized Occupational Therapy supports. Occupational Therapy requirements must be substantiated by an assessment or evaluation and be included as a recommendation on the individual's ISP. Speech Therapy (Program Code 52S): An hourly rate of $39.16 is reimbursed to therapists or their payees for the costs associated with providing authorized Speech Therapy supports. Speech Therapy requirements must be substantiated by an assessment or evaluation and be included as a recommendation on the individual's ISP. Supports Not Requiring Medicaid Denial - Authorization for billing for the following supports are included in each individual's CILA rate. Licensed or DHS-approved professionals providing the supports required bill the Department directly following the delivery of the service. Behavior Services - Intervention Planning (Program Code 56U): An hourly rate of $54.40 is reimbursed to the professionals or their payees for the costs associated with providing Behavior Services - Intervention Planning supports. All persons enrolled in CILA services are authorized for 48 annual hours of Behavior Services -Intervention Planning and providers may bill for up to that amount given that these services have been provided and are needed by the individual as reported in the Individual Service Plan (ISP). Behavior Services -Intervention Planning is the amelioration or reduction of maladaptive behavior in an individual and the incorporation of adaptive behavior/coping skills. These services include ongoing assessment, functional analysis, development of positive intervention strategies and techniques, participation in individual services/support plan development, training of family, direct support and other workers, and monitoring the effectiveness of the interventions. Qualified providers are: 1) Licensed Clinical Psychologist, and 2) DHS-approved Behavior Analyst. Individual Therapy: An hourly rate of $34.80 is reimbursed to therapists or their payees for the costs associated with providing Individual Therapy supports. All persons enrolled in CILA services are authorized for 60 annual hours of Individual Therapy services and professionals may bill for up to that amount (in combination with other therapy and counseling services not including Behavioral Services - Intervention Planning) given that these services have been provided and are needed by the individual as reported in the Individual Service Plan (ISP). Therapy is a treatment approach in which one or more professionals deliberately establish a relationship with a client in ongoing periodic formal sessions with the goal of ameliorating or reducing the symptoms of emotional, cognitive or behavioral disorder and promoting positive emotional, cognitive, and behavioral development. Qualified providers are: 1) Licensed Clinical Psychologist; 2) Licensed Clinical Social Worker; 3) Licensed Marriage and Family Therapist; 4) Licensed Clinical Professional Counselor. Group Therapy: See "Individual Therapy" above. Assumes "group" session. An hourly rate of $11.60 is reimbursed to community agencies for the costs associated with providing Group Therapy supports. All persons enrolled in CILA services are authorized for 60 annual hours of Group Therapy services and therapists may bill for up to that amount (in combination with other therapy and counseling services not including Behavioral Services - Intervention Planning) given that these services have been provided and are needed by the individual as reported in the Individual Service Plan (ISP). Authorized providers are: 1) Licensed Clinical Psychologist; 2) Licensed Clinical Social Worker; 3) Licensed Marriage and Family Therapist; 4) Licensed Clinical Professional Counselor. Individual Counseling: An hourly rate of $27.84 is reimbursed to counselors or their payees for the costs associated with providing Individual Counseling supports. All persons enrolled in CILA services are authorized for 60 annual hours of Individual Counseling services and counselors may bill for up to that amount (in combination with other therapy and counseling services not including Behavioral Services - Intervention Planning) given that these services have been provided and are needed by the individual as reported in the Individual Service Plan (ISP). Counseling is a treatment approach in which one or more professionals meet with a client in ongoing periodic formal sessions, and uses relationship skills to promote the client's abilities to deal with daily living issues associated with their emotional, cognitive or behavioral problems using a variety of supportive and re-educative techniques. Authorized providers are: 1) Licensed Clinical Psychologist; 2) Licensed Clinical Social Worker; 3) Licensed Social Worker; 4) Licensed Marriage and Family Therapist; 5) Licensed Clinical Professional Counselor; 6) Licensed Professional Counselor. Group Counseling: See "Individual Counseling" above. Assumes "group"session. An hourly rate of $9.28 is reimbursed to counselors or their payees for the costs associated with providing Group Therapy supports. All persons enrolled in CILA services are authorized for 60 annual hours of Group Counseling services and counselors may bill for up to that amount (in combination with other therapy and counseling services not including Behavioral Services - Intervention Planning) given that these services have been provided and are needed by the individual as reported in the Individual Service Plan (ISP). Authorized providers are: 1) Licensed Clinical Psychologist; 2) Licensed Clinical Social Worker; 3) Licensed Social Worker; 4) Licensed Marriage and Family Therapist; 5) Licensed Clinical Professional Counselor; 6) Licensed Professional Counselor. Copy of the Individual Service Plan (ISP). Evaluations and Assessment: The community agency is required to submit a person's most recent Psychological Evaluation and have evaluations and/or assessments covering all areas for which the agency is requesting Non-Base Support reimbursement. For example, if reimbursement is being sought to cover the costs associated with the provision of PT, OT, or Speech Therapy, an accompanying evaluation or assessment performed by a qualified licensed professional of the same discipline recommending the specific therapy or service must be accompany the rate request. The person's (ISP) must also contain a recommendation by the Community Support Team (CST) which declares the therapies and supports to be necessary. The ISP must also contain goals and objectives associated with the requested NonBase Supports. Psychological Evaluation - The Psychological Evaluation is required to be submitted with the rate request and must have been performed within the last three years. The ISP should document any recommendations made by the psychologist to substantiate the need to provide NonBase Supports. Psychiatric Evaluation - For persons who also have psychiatric involvement, a current Psychiatric Evaluation must be sent with the rate request if funding for NonBase Supports are being requested. The Third Party Payment is assumed to be used first to offset the costs associated with providing Room and Board to the persons living in CILA homes. When an individual's Third Party Payment is insufficient to cover the full allowance provided for Room and Board, the Department supplements the difference. When an individual's Third Party Payment exceeds the Room and Board allowance, the remainder is used to offset the other program costs associated with the provision of CILA supports. The Third Party Payment is comprised of "Earned Income," "Unearned Income," "HUD Assistance," and the "Food Stamp Credit." "Earned Income" are those monies received by persons living in CILA homes from employment or Day Program activities. When persons living in CILA homes earn income, a portion is applied to their Third Party Payment. The Model "disregards," or ignores, the first $55 of an individual's monthly earned income. For every dollar thereafter, $0.50 is applied toward their Third Party Payment. In the example to the right, the individual is earning $56.00 per month. Unearned Income: Persons residing in CILA homes generally receive some form of "Unearned Income." Unearned Income is that income derived from Social Security Income (SSI), Social Security Disability Income (SSDI), Railroad Retirement Benefits, Veteran's Survivor Benefits, etc. These categories are listed on the Community Reimbursement Financial Questionnaire. The Model disregards the first $50.00 of an individual's total monthly Unearned Income and applies the remainder toward the person's Third Party Payment. HUD Assistance: HUD allowances, and/or Section 8 Housing Rental Assistance, per individual, must be reported on the Community Reimbursement Financial Questionnaire (DHS 403c). The Department's Third Party Payment offset for HUD and Section 8 housing assistance is capped to cover only the costs associated with "Housing and Utilities," "Telephone," "Maintenance and Housekeeping," and "Property and Building Insurance" as calculated by the Model. Amounts received from HUD over and above the reimbursement levels for these cost centers are ignored in the calculation of the Third Party Payment. Community providers should simply report the full individual HUD assistance amount on the DHS 403c. The applicable offset is calculated by the Model and indicated on the individual Rate Sheet in the Third Party Payment section. Food Stamps: An offset equal to $360 per person, per year, is added to the Third Party Payment. The $360 per person, per year, Food Stamp offset is fixed and is applied to all individual CILA rate determined by the Model. The Model disregards Food Stamps received by individuals in excess of $360 per person, per year. A "Minimum Third Party Payment" equal to $5,568 is used in the CILA Model. This minimum is calculated by assuming an Unearned Income annual receipt of $5,808, less the $50 per month of Unearned Income disregard, plus $360 per year for the Food Stamp offset. The Model defaults to a Third Party Payment equal to $5,568 for persons whose reported Third Party Payments are less than the minimum. This section describes the general administrative process and paperwork requirements for getting an individual CILA rate calculated and approved, completing an Individual Rate Review, and terminating an individual from CILA services. The process described below is in effect on January 1, 2002 and is subject to change. The following section lays out the general steps required between the submission of an Individual CILA Rate Packet to receiving reimbursement for providing supports to that person. The process as described below is that which is in effect at the time of this writing (January 2002). See Addendum #14 for examples of the "correspondence memos" used by the CILA Rates Unit. Cover letter from PAS/ISC agency (see below). The PAS/ISC agency reviews the Rate Packet for completeness and accuracy, signs the Individual Rate Work Sheet (Page 5), and forwards it to the community agency's Network Facilitator. The Network Facilitator reviews the Rate Packet for completeness and accuracy. Network Facilitators confirm the "Rate Type," "Resident Location Type," "Residential Capacity" of the home, and other individual information. Upon completion of their review and approval, the Network Facilitator attaches a "Rate Packet Transmission Sheet" and forwards it to their Network Coordinator. Incomplete Rate Packets are returned to the community agency. The Network Coordinator confirms the information provided on the Rate Packet Transmission Sheet and forwards it to the Associate Director of the Office of Developmental Disabilities. The Associate Director approves the use of CILA capacity for the person for whom the Rate Packet has been submitted, signs-off on the Rate Packet, and forwards it to the CILA Rates Unit in the Bureau of Community Reimbursement. The CILA Rates Unit completes a "Rate Packet Approval Cover Sheet" which summarizes and confirms critical aspects of some of the rate determining factors contained within the Rate Packet and calculates the individual rate. The information from the Rate Packet is entered into the CILA Individualized Rate Model and a rate is determined. An Individual Rate Sheet is printed and a "Prepared to Fund Memo" is attached, signed by the Bureau Chief of the Bureau of Community Reimbursement, and the Individual Rate Sheet and the Prepared to Fund memo are mailed to the community agency. The community agency reviews the Individual Rate Sheet for accuracy and determines whether or not to accept the CILA rate for providing supports to the person. The community agency is instructed to mail or fax a "notice of acceptance" to the CILA Rates Unit within ten working days of the date on the "Prepared to Fund Memo." Suspected errors on the Individual CILA Rate Sheet should be reported to the CILA Rates Unit. If the community agency does not accept the rate, the CILA Rate Unit returns the Rate Packet to the Network Facilitator and a "Rejection of CILA Rate" memo is sent to the community agency that confirms the agency's decision and the Department's receipt of the notice to decline. Upon receipt of a notice of acceptance of the CILA rate from the community agency, the CILA Rates Unit prepares an "Award Memo," obtains the signature of the Associate Director of the Office of Developmental Disabilities, and mails it to the community agency. A copy of the Award Memo is sent to the PAS/ISC agency, the Network Facilitator, the Bureau of Accreditation, Licensure, and Certification, and a copy is placed in the individual's CILA file. The CILA Rates Unit places the date of the "Award Memo" in the "Approval Date" field in the CILA Log. The community agency must call of the Bureau of Accreditation, Licensure, and Certification within the Office of Clinical, Administration, and Program Support (OCAPS) to confirm the address of the CILA home within which the individual will be living and, upon receipt of this information, forwards a copy of the Award Memo for payment processing. The community agency should forward a copy of the Award Memo and Rate Sheet to the originating PAS/ISC agency if that agency is different than the receiving PAS/ISC agency. The community agency is responsible for informing the PAS/ISC agency when a person has begun receiving CILA supports. The Originating PAS/ISC agency completes the OBRA record, including the OBRA 8, and electronically transmits the complete OBRA record to the Department. The CILA Rates Unit enters the Original Date of Placement in the CILA Log and calculates a Individual Rate Review Due Date. The following section describes the general procedures and responsibilities of community CILA provider agencies and PAS/ISC agencies in the Individual Rate Review process. Since November 1, 1996, all PAS/ISC agency grants have included funding for the monitoring of all persons receiving CILA supports funded through the Rate Model. Rate Reviews are required for all persons whose individual CILA rates were determined via the CILA Rate Model. Rate Reviews are scheduled for six months following the "Original Date of Placement" of the person into CILA services and annually from that point on unless otherwise indicated on the Individual Rate Sheet. Community agencies make any corrections to the information contained on the Rate Review Sheet, attach a new DHS403c Financial Questionnaire and any NonBase Support Review Forms necessary, and forward the entire Rate Review packet to the PAS/ISC agency which reviews, confirms the information, and signs the Rate Review Sheet. The PAS/ISC agency forwards the completed Rate Review packet to the CILA Rates Unit. Current Nursing Services Packet, including an Medication Administration Review (MAR), Treatment Administration Review (TAR) and sign-off by a Registered Nurse. NonBase Support Review Form confirming utilization of any NonBase (Individual) Supports that are included in the individual rate. Rate Reviews with no NonBase Supports, no changes to the Base Support variables, and that have all the documentation required are processed by the CILA Rates Unit. The results are photocopied and mailed with a "Rate Review Results Memo" to the community agency and the Network Facilitator. A copy is placed in the individual file. For Rates Reviews with missing documentation, the CILA Rates Unit attaches a "Rate Review Missing Documentation" memo, (e.g., missing DHS 403c, Nursing Services Packet, community or PAS/ISC agency signatures, etc.) and mails it back to the community agency. Copies are forwarded to the Network Facilitator and placed in the individual's file. NOTE: Rate Review missing only PAS/ISC agency signature are mailed directly to the PAS/ISC agency. The CILA Rates Unit reviews the information in the Rate Review packet consistent with past Department practice or the Nursing Services Packet guidelines established by the Department. The CILA Rates Unit ensures all documentation is attached. The CILA Rates Unit consults with the Network Facilitator, the community agency, and the PAS/ISC agency as necessary. Once the Rate Review is approved, it is forwarded within the CILA Rates Unit to have the revised CILA individual rate determined. The CILA Rates Unit revises the CILA Log as indicated on the Rate Review Sheet, reruns the CILA rate, attaches a "Rate Review Results" memo, and mails it to the community agency. Copies are inserted into the individual file and sent to the Network Facilitator. Individual Rates are reviewed six months following the original date of placement of the individual into CILA services. After this initial review, rate reviews are scheduled on an annual basis unless extenuating circumstances justify more frequent reviews. The CILA Rates Unit regenerates all Rate Review Sheets that are "Overdue 60 Days," attaches a "Rate Review Overdue 60 Days" memo, and mails them to the community agency, the Network Facilitator, and inserts a copy into the individual's file. The CILA Rates Unit regenerates all Rate Review Sheets that are "Overdue 90 Days," attaches an "Rate Review Overdue 90 Days" memo, and mails them to the provider agency, the Network Facilitator, and inserts a copy into the individual's file. This is done each month for as long as the Rate Review is Overdue 90 days and "On Hold." An individual, or a community agency with the individual's consent, wishes to terminate CILA services. The individual signs a DHS 1202, "Notice of Right to Appeal" or similar statement confirming their desire and willingness to relinquish their CILA supports, or the community provider confirms their willingness to transfer a person's CILA capacity to another community agency. The community agency completes a paper OBRA 8A, attaches the DHS 1202, and forwards it to the PAS/ISC agency. The PAS/ISC agency prepares a cover letter explaining the circumstances for the termination request, signs and forwards the paper OBRA 8A, the DHS 1202 or similar documentation, and the cover letter, to the Network Facilitator. The Network Facilitator, confirms the individual's choice to terminate CILA services, approves the CILA termination, determines if the CILA capacity will remain at or move to another community agency, signs the OBRA 8A, and forwards it to the CILA Rates Unit. The CILA Rates Unit, upon receipt of the Network Facilitator's approval of the termination prepares a "Recognition of Termination" memo. The memo is mailed to the community agency, the PAS/ISC agency, and various entities within the Department. The CILA Rates Unit notes the termination on the CILA Vacancy Report, or moves the CILA capacity based upon the direction of the Network Facilitator. The individual is terminated from the CILA payment system by the Office of Clinical, Administrative, and Program Support (OCAPS). A community agency wishes to terminate CILA services to an individual without the individual's (or the guardian's) consent. The community agency forwards a termination notice to the individual (or their guardian) with a projected date of termination and the reason for the termination, as well as instructions as to the individual's right to appeal to the termination of CILA services, including the process and time frames for an appeal. The notice must provided at least 30 days in advance of the projected date of termination. The provider agency confirms the discharge date with the individual or their guardian. The community agency completes the paper OBRA 8A and forwards to the PAS/ISC agency. PAS/ISC agency signs the paper OBRA 8A and forwards it to the Network Facilitator. The Network Facilitator confirms the appropriateness of the termination and, upon doing so, forwards the paper OBRA 8A and the attached documentation to the CILA Rates Unit. The CILA Rates Unit prepares a "Recognition of Termination" memo and mails it to the community agency, PAS/ISC, and the Network Facilitator, OCAPS, and places a copy in the individual's file. The CILA Rates Unit notes the termination on the CILA Vacancy Report, or moves the CILA capacity based on the direction of the Network Facilitator. An individual may not be terminated from CILA services until all appeals are exhausted, or the individual does not exercise their appeal right, or the individual becomes willing to terminate CILA services. Given a final decision, the CILA Rates Unit and the Office of Clinical, Administrative, and Program Support (OCAPS) confirm that the individual has either chosen not to exercise their appeal rights, or that all appeal rights have been exhausted. Given confirmation, OCAPS terminates the individual from the CILA payment system. OCAPS calculates the payment adjustment due to, or owed by, the community agency from the termination date.